This beautiful holiday home, which used to be the bakery of a farm somewhat further away, is a nice place to enjoy together. Enjoy the romantic atmosphere and the view. 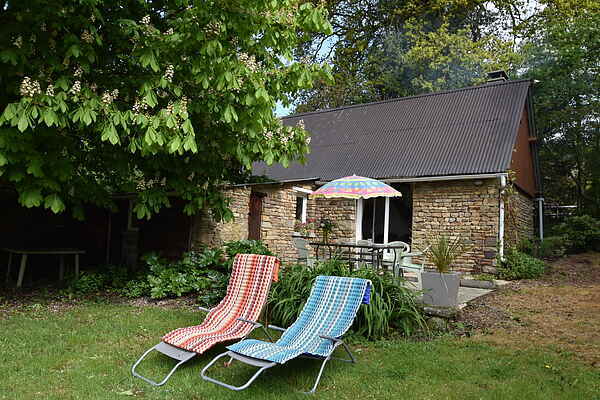 From the gravel terrace with wooden picknick table and two lounging chairs you have a beautiful, open view of Normandy's countryside. In front of the house is a large, sloping lawn with fruit trees. The house's interior is neat and simple. From the living room you open the doors onto the terrace. The house is situated between Vire (22 km) and St. Lô (27 km). Visit the animal friendly park Champrénus (29 km), where several species on the brink of extinction are being bred, such as, the Sumatran tiger and the Persian leopard. Another recommendation is the town Villedieu-les-Poêles (21 km) with its bell foundries and copper workshops. Would you prefer the sea? Reserve a day for Bréhal (47 km) and Granville (49 km), which, apart from sandy beaches, also have several fun museums. Naturally you can't miss famous spots like Mont-St. Michel (65 km) and Bayeux (63 km), with its tapestry and museum about the Battle of Normandy. The impressive ruins of the abbey of Hambye at 28 km.